Pool Safety Barriers | BabySecure Inc. The 2012 Lifesaving Society’s Canadian Drowning report, finds backyard swimming pools are the number one aquatic setting for children under 5 years to drown. It is clear therefore that child safety needs be a major concern for ALL pool owners. A lack in active adult supervision is a main cause of these drownings (62%), but the good news is, there are several steps that pool owners can take to get some help to improve their supervision around the pool. Babysecure is making an effort to educate people on the seriousness of the situation, and provide the tools and services needed to keep your pool secure. Pool safety is not just fences and locks. It is an awareness. An understanding that you have a potential hazard in your backyard and a responsibilty to avoid injury not only to your family but others in your neighbourhood.There are several resources for you to learn more about pool safety and drowning prevention, a few of them include.... Safe Kids Canada, Red Cross, Royal Lifesaving Society. Being a pool owner comes with the responsibility of preventing drowning for members of your family and friends but also your neighbours. Quebecers do not fare well on this account. While Quebec represents only a quarter of Canada’s population, we have 44% of all the backyard pools in Canada. This leads to Quebec having the largest number of drowning deaths in private pools, averaging 11 per year - and more than half are toddlers under 4 years of age. Across the country, drowning is amongst the top reasons for injury death in all age groups even into the senior years. The Quebec government, along with other provinces and countries, have legislated additional pool security. Municipalities have the last word on pool regulations so restrictions may vary but they must meet the minimum provincial standard. Contact your municipal Urban Planning department to find out what specific requirements are for your municipality. In Quebec, there is a province-wide minimum standard for the construction of new pools. Regardless of where you pool is new or older than the law which came into effect 2011, the safer approach for any pool owner, is to comply with its standards. The law requires “four-sided” fencing with a gate. Four-sided refers to fencing around all sides of the pool. This can include a wall of the house as long as there are no doors or windows which could directly access the open pool. Hedges are not considered sufficent barriers as little children could get through. The new law also requires the fence to be minimum 4 ft high with a self-closing, self-locking gate. The locking mechanism must be at the top of the gate, to insure the entrance to the pool is always restricted to children. Given the need to have to take safety measures around pools, All-Safe provides different solutions to protect against drowning. Every pool owner has their own individual preferences when it comes to pool safety and this is why All-Safe has three different types of barriers to offer. The factors involved in making the appropriate choice of barrier include efficiency, affordability, esthetics, ease of use and legal obligations. All-Safe pool fences are the most popular, cost effective, and versatile method to provide safety around a pool. Popular because of its see-through quality which does not abruptly change the look of your yard. While easy to completely remove, because it stays up by tension, this fencing needs to be proffesionally installed. The fence is installed directily into a concrete or uni-stone patio and it is not intended for long distances through the grass. The fence can also be installed into a wood or composite deck. Designed to be climb resistant, the fence has undergone rigorous testing to keep children and small animals out. Without climbing aids such as nearby rocks, planters, patio chairs, etc., the pool fence is virtually unclimbable. 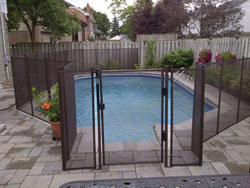 All-Safe pool fences are available in 48 and 60 inches in height, and in four different colours. All-Safe also offers features such as a self closing self latching gate (which is also removable) and other exclusive features such as angled panels, e-z close handles and custom panels to meet the needs of landscaping around the pool. The fence is composed of a mesh made with 100% polyester bonded monofilament thread. This mesh is mounted on re-inforced 1" marine grade alluminum poles. 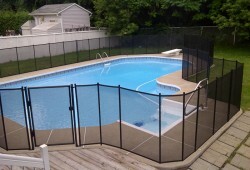 The All-Safe pool fence also features a quadruple stitch polyester border to prevent stretching of the panels. The poles undergo an 8 stage paint process including an epoxy primer to provide the highest durability in the industry. There are many other fence products on the market but none can match All-Safe's variety, dependability, and versatility. All-Safe has so much confidence in their product that they back it with a lifetime warranty. Pool owners who are looking for pool safety with the added bonus of a leaf cover will definitely be interested in the Mesh Pool Cover. The Mesh Pool Cover keeps your pool clean as a bonus. The cover is custom fitted to your pool and similar to the net cover, it is attached to the pool deck with brass anchors. The mesh is a breathable fabric which allows water to pass through it but not dirt and debris. While acting as a filter, the cover also helps to retain heat and chemicals in the pool for added savings. The polypropelene mesh gains its strength from the 34X22 per square inch thread count which gives 4000 pounds of tensile strength. Specially designed heavy duty springs pull the cover taught and keep it down so that dirt wont blow underneath it. The cover is strong enough to support the weight of a child and two adults. The cover is also suitable for Canadian winter, when ice forms inside the pool, it acts as a table to support all the snow that weighs down the cover over winter. As the snow melts, it just passes straight into the pool, and by spring you wont have nearly as much work to do to open your pool. All-Safe has been an industry leader in pool safety for over 20 years. Their superior product construction, product versatility, and professionalism in installation have granted them international success. Every All-Safe installer has undergone training at the All-Safe headquarters in Orange County California, where secondary pool safety barriers have been law for decades. All of their products have undergone strenuous testing under the ASTM standards in the United States, and the quality is reflected in their warranties. All-Safe is right choice to protect your family, and to safeguard your pool. Call today for an estimate. Please visit www.allsafepool.com for more information. Enjoy your summer around the pool.